Brittany does look great with dark hair! The blonde shades she used to favour were great, but not as flattering as this rich shade of brown with balayage touches of copper! This style is good for anyone with a narrow, heart-shaped face because of the attractive natural volume provided by the smoothly waved sides. This medium bob haircut is mostly cut in one-length, allowing for moulded head waves to give pretty texture and movement at the sides. Curving the ends under also adds volume at the tips and accentuates her mouth and chin. Around the forehead, the hair is slightly raised in a softly shaped wave that fames her face and moves down to highlight her gorgeous, large brown eyes and well defined eyebrows. And enriching the deep brown hair colour, those subtle glints of trendy, copper balayage accentuate the smooth movement of the head waves to perfection! 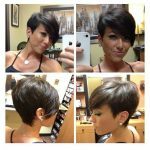 Do you love this cute bob haircut? If not, you can find more bob hairstyles in this bob hairstyles gallery.